We're finally getting some warmer weather in Chicago, and Mugsy couldn't be any more thrilled. We can see the grass again! How is it going? I miss you. I hope things are going well with you and your family. Enjoy your summer! Mommy said, summer in chicago is great!! 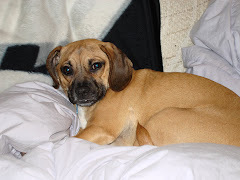 Hi Mugsy the Snuggle Puggle my name is Ariel and I am a Chicago IL USA doggie too. It is so nice to meet you. Have a Barking Great day! Mugsy the puggle lives in a suburb outside of Chicago, Illinois. Her main interests are eating, sleeping, looking out the window, and destroying stuffies. 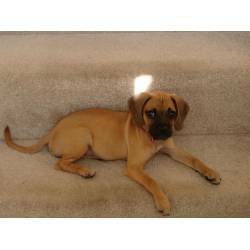 Vote for MugsyPuggle on PuppyWar! 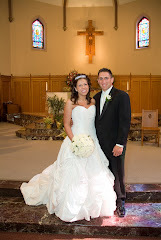 Mom and Dad on their wedding day... I was a mere four weeks old, and couldn't be there!